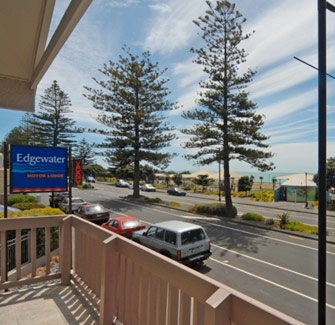 Edgewater Motor Lodge on Napier’s scenic waterfront has 20 self-contained motel units, all with ocean views, tea/coffee making facilities, free unlimited Wi-Fi internet and outdoor seating. Choose from spacious studio motel units, some with spa baths, motel units with access bathrooms and 1 and 2 bedroom motel apartments, some with full kitchen facilities. 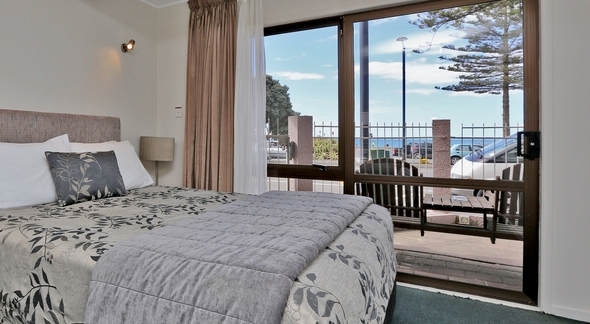 Easy walking distance to Napier city centre, Marine Parade attractions, cycling and walking tracks, restaurants and cafés. Sleeps 6 people, Queen size bed in one bedroom, 2 singles in the other and 2 singles in the living area. Has 3 x 2-seater couches, a table that seats 6 and a full kitchen. Has an access bathroom. Downstairs, opens onto a courtyard. OCEAN VIEWS. Sleeps 3. King size bed and single fold out couch, double spa bath and separate shower. Two hot plates, electric frying pan, tea, coffee, toaster and microwave facilities. Opens onto a courtyard. OCEAN VIEWS. Sleeps 2. Queen size bed, tea, coffee, toaster, fridge and microwave facilities. Opens onto a courtyard. OCEAN VIEWS. Sleeps 6 people, Queen size bed in one bedroom, 2 singles in the other and 2 singles in the living area. Has 3 x 2-seater couches, a table that seats 6 and a full kitchen. Upstairs, opens onto balcony, OCEAN VIEWS. Sleeps 3. King size bed and a single fold out couch. Two hot plates, electric frying pan, tea, coffee, toaster, fridge and microwave facilities. Upstairs, opens onto a balcony. OCEAN VIEWS. Sleeps 2. Queen size bed, tea, coffee, toaster, fridge and microwave facilities. Upstairs, opens onto balcony. OCEAN VIEWS. Sleeps 3. Queen size bed and single bed in the same area. Spa bath, tea, coffee, toaster, fridge and microwave facilities. Opens onto a courtyard. OCEAN VIEWS. Sleeps 3. Queen size bed and single bed in the same area. Two hot plates, tea, coffee, toaster, fridge and microwave facilities. Opens onto a courtyard. OCEAN VIEWS. Sleeps 4. Two single beds in the bedroom and Queen size bed in the living area. Has 2 x 2-seater couches and a table that seats 5. Has 2 hot plates, electric frying pan, tea, coffee, toaster, fridge and microwave facilities. Has an access bathroom. Downstairs, opens onto a courtyard. OCEAN VIEWS. Sleeps 4. Queen size bed in the bedroom and queen size bed in the living area. Has 2 x 2-seater couches, a bench seat and a table that seats 5. Has 2 hot plates, electric frying pan, tea, coffee, toaster, fridge and microwave facilities. Upstairs, opens on to a balcony. OCEAN VIEWS. Sleeps 3. Queen size bed and single bed in the same area. Tea, coffee, toaster, fridge and microwave facilities. Upstairs, opens on to a balcony. OCEAN VIEWS. Sleeps 3. Queen size bed and a single bed. Tea, coffee, toaster, fridge and microwave facilities. Upstairs, opens on to balcony. OCEAN VIEWS. Sleeps 5. This unit is upstairs, on 2 levels. The lower level has the queen bedroom, living area with 2 couches, table and chairs for 6 and a full kitchen with fridge/freezer and oven. A bathroom with a double spa bath. The unit opens onto a balcony. The upper level has a bedroom with 3 single beds and a bathroom with shower and toilet. OCEAN VIEWS. 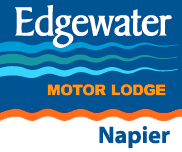 At Edgewater Motor Lodge late cancellations have a significant impact. No charge is incurred if 48 hours notice is given for a reservation cancelled for a non-peak period. If less than 48 hours notice is given, or for no-shows, one night's tariff may be incurred. Tariff $104 - $210 (2 persons). Peak season rates/conditions may apply. Corporate rates available. Current rates can be confirmed on booking. All rates shown are in New Zealand dollars and include GST.